Dog puzzles are a great way of engaging your dog’s brain. Not only do they stimulate your dog’s natural abilities of problem-solving, hunting and scent detection but they also help alleviate boredom. In fact, the more we engage our dogs in games that interest and challenge them, the less likely they are to indulge in destructive behaviours. Dog puzzles come in all shapes and sizes but loosely fall into two camps; supervised and unsupervised. While unsupervised puzzle toys appeal to many, especially when the time is short, or a dog is home alone, it’s vital you know your dog well. Aggressive chewers can destroy even the most robust toys. As soon as toys become damaged, take them away from your dog. Not sure whether your dog will chew a toy to the point of destruction or not? Keep an eye on your dog until you’re sure it’s safe to leave them alone with the puzzle. If you’re introducing your dog to a puzzle toy for the first time, don’t expect them automatically to know what to do with it. Whether you’re using a toy or food puzzle, you may need to help your dog understand the game. Just like when we learn something for the first time, the process can be frustrating if the subject’s too hard. So, start your dog on something simple and work up to more complex puzzles. Food dispensing toys are a great place to start. While some dogs are more toy motivated, most dogs will work for food if the treats are high value enough. One of the other advantages of food puzzles is that they come in all shapes and sizes and many are suitable for your dog when they are alone (with caution). Set your dog up for success. If your dog is struggling to work out what to do, help. It won’t benefit either of you if your dog gets frustrated or overwhelmed. Make it easy, to begin with, and once your dog understands the game, you can increase the difficulty as your dog gets better at it. There are many benefits to using puzzle toys and games not least that it will tire your dog. But puzzle toys do more than that; they can be a real aid in addressing problem behaviours. Not only do puzzles get a dog to use their brain but many of them encourage natural behaviours like sniffing and hunting for food. As scent is linked directly to a dog’s limbic system sniffing can positively affect their mood. So, puzzles that require your dog to ‘hunt’ for and smell out food can make your dog feel calm and happy. A perfect reason to use them with dogs that suffer separation anxiety. Some dogs are so enthusiastic when they eat it can cause issues. Fast eaters not only tend to eat and then vomit but they are also at risk of bloat – a life-threatening condition. Slowing a dog’s meal also means that they get to experience one of the highlights of their day for longer. So, here’s our favourite selection of puzzle toys suitable for both novice and experienced dogs. No list would be complete without the Kong. The Kong is versatile and can be used without or without treats. As a throw toy, the unusual shape makes for an unpredictable bounce that dogs love. It can also be filled with treats or smeared with peanut butter for dogs that are new to puzzle toys. And once your dog is working for food, you can stuff and freeze the Kong to make a long-lasting and challenging popsicle for your dog to enjoy. Made from durable rubber the Kong is made especially for strong chewers. It’s worth noting that no toy is entirely chew-proof, but it does hold up well to most dogs. This is a great game to play with your dog. Once you’ve helped them work out what to do they will be happy to keep spinning those bones. Although we would suggest that this toy is always used with supervision as it’s not chew-proof, it will give your dog a mental workout and is fun too. The different size bones add variety, with the short bones offering an easier win for your dog. It’s well made but can be pushed over by an over-enthusiastic dog. We love the Buster activity mat as its suitable for puppies through to oldies and can grow as your dog learns how to solve each puzzle. The Buster mat comes with three challenges as part of the starter set, each with three levels of difficulty. Once your dog has mastered these, you can buy extra games for your dog to enjoy. The Buster mat is made from sturdy nylon and comes with a convenient carry bag for activities on the go. It’s is perfect for the novice or experienced problem solvers. We make no apologies for including a second Kong product in our choices. The Kong wobbler is tough, fun and unpredictable.The Wobbler’s size means that you can put your dog’s whole meal in it, which is the perfect way to slow down eating.The weighted anti-slip bottom gives the Wobbler an unpredictable wobble as your dog noses or paws at it that encourages your dog to play.While this toy is robust, it’s worth noting that it won’t stand up to tough chewing, unlike other Kongs the wobbler is hard plastic, not rubber. So always remove it after your dog has finished playing with it. If you want to give your dog a real mental challenge, then the Seek-A-Treat Shuffle Bone is perfect. There are ten holes in which treats can be hidden and then depending on the difficulty they can be left open or covered by the six disks. Your dog’s job is to work out that they can slide the disks to get the treats underneath. Made of sturdy wood, the Seek-A-Treat is perfect for supervised and interactive play. Trixie has a variety of puzzle games or dogs. We particularly like this flip board which Trixie classes as a ‘Training level 2’ or suitable for an intermediate dog puzzler. Made of sturdy plastic the flip board has sliders, flaps and hats that need to be lifted off to get a treat. There’s enough variety to keep your dog interested, and you can introduce each element separately to extend the learning period. If your dog is more toy motivated, this puzzle from Outward hound could offer the perfect alternative to food games. Depending on your choice of size, your dog could have fun hunting out up to six squirrels nestling in a tree trunk. Not only will your dog enjoy pulling the squirrels from their hiding place, but each toy has a squeaker. Whether you play, hide the squirrel or toss and fetch the squirrel your dog is in for a treat. Risk of flying squirrels – if your dog shakes toys to kill them you may need to protect delicate objects! Our list wouldn’t be complete without at least one puzzle from the Queen of dog puzzles Nina Ottosson. 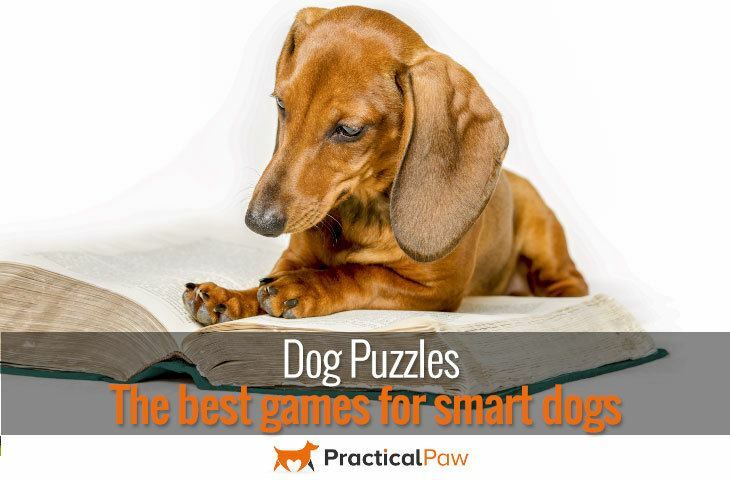 So, if your dog’s an experienced puzzle solver, the will love the challenge of this game. Not only can they pick up the bones but there are also little drawers for them to pull open to reveal treats. What’s more, you can vary the difficulty by locking specific flaps with the bone shape pegs provided. If you love apps this is a perfect game for you and your dog. GoBone is controlled by your iPhone or Smartphone. GoBone has an automatic play mode that moves the bone for ten minutes and then sleeps for twenty minutes for up to eight hours. Its smart technology means that the movement is personalised to your dog’s age, weight and breed. Not only that but if you want to get involved, you can play with the GoBone via the app making it a gaming experience for you too. Bringing interacting with your dog bang up to date the GoBone is a fun way to play chase with your dog! For real versatility and toughness, you can’t beat the Kong. Not only does it serve as a throw toy, but it can be stuffed with kibble or other foodstuffs and frozen for long-lasting entertainment. Puzzle toys are an ideal way of getting your dog to use their brain. But they should be used interactively, with your input too.